When we woke up it was still dark. We had agreed to aim to leave at 6:30am to beat the crowds in Yosemite. We were on the road by 6:45 and watched the golden morning sunlight spread across the high desert plains around Mono Lake. 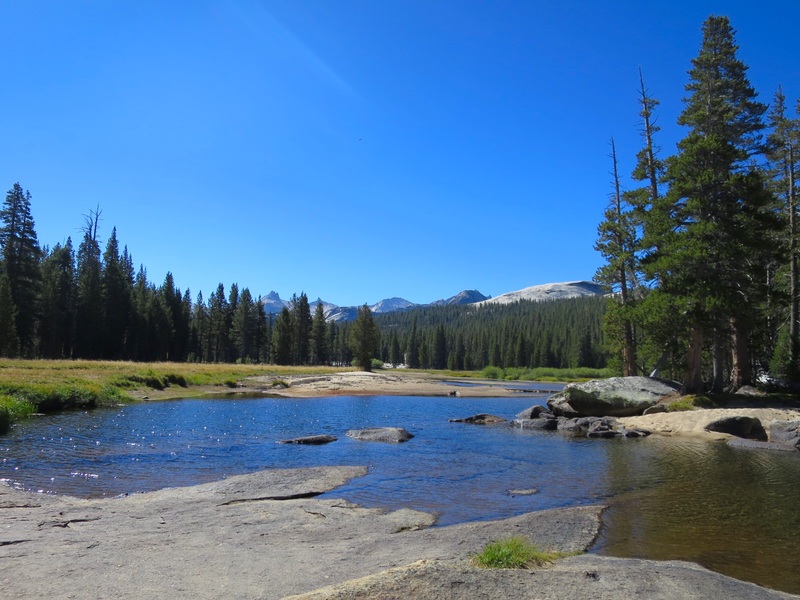 We found a parking spot at the Lembert Dome/Glen Aulin trailhead and sat in the RV eating breakfast. It was cold outside, the car temperature gauge read 37 degrees, and it was much more comfortable eating inside the cozy van than outside. We take advantage of these comforts when we have access to them. Our socks weren’t fully dry from yesterday’s washing so we draped them over our backpacks in the sun while we ate. Laurie’s socks were still damp when we walked out of the parking lot at 9 am. There was a chill in the air and Laurie placed Andy’s fleece around her arms and chest. 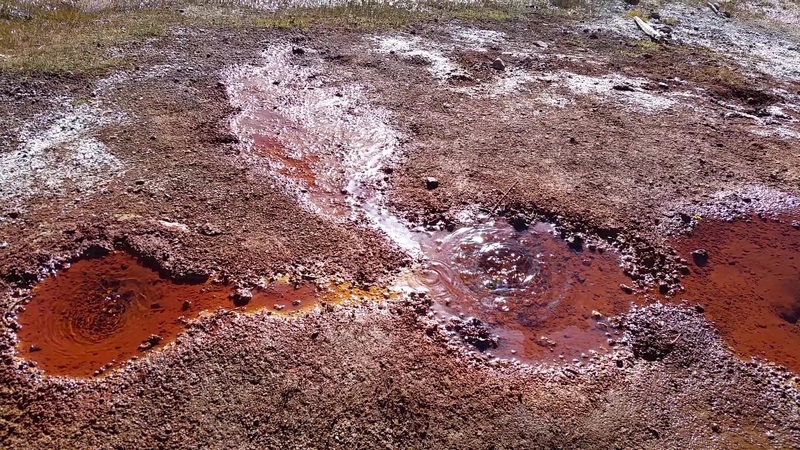 We stopped at Soda Springs and watched the carbonated water bubble out of the ground. 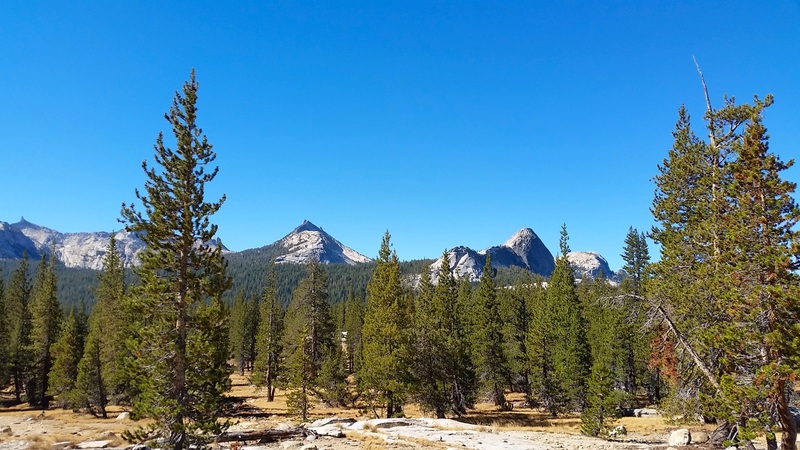 Sue pointed out where she had camped as a child, back before Yosemite required permits for backpacking. The trail was flat initially. 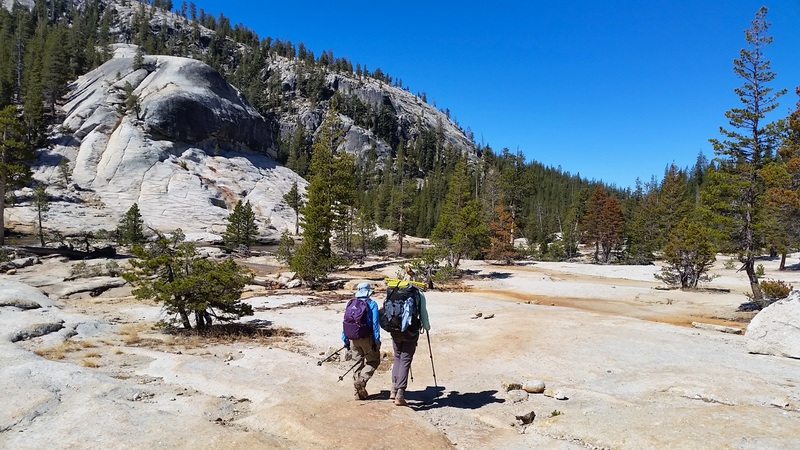 We walked through dusty sand, following the horse prints toward Glen Aulin High Sierra Camp. 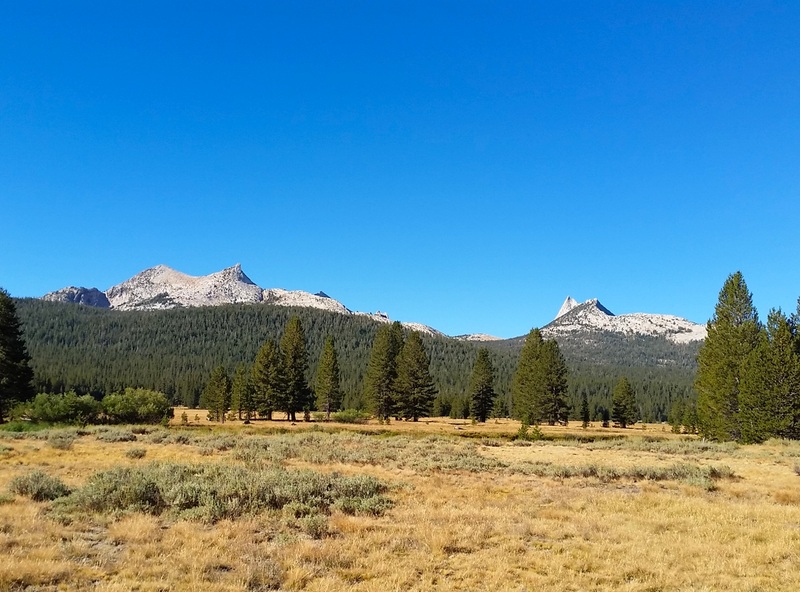 Neither of us have hiked north of Tuolumne Meadows and were excited to see new terrain. 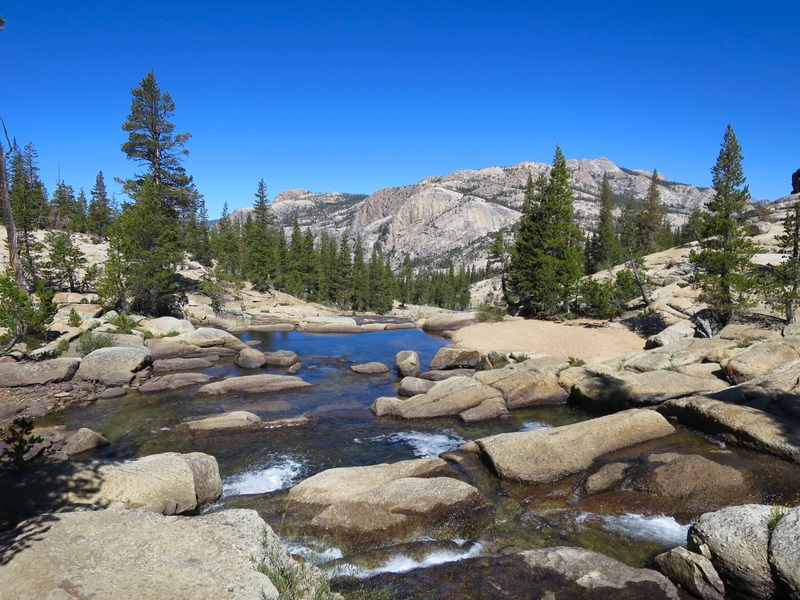 We walked past large slabs of granite, meandering streams over granite or sandy banks and large yellow meadows. It is beginning to look like fall. We walked on rocks assembled like cobblestones and used our poles to keep from slipping. 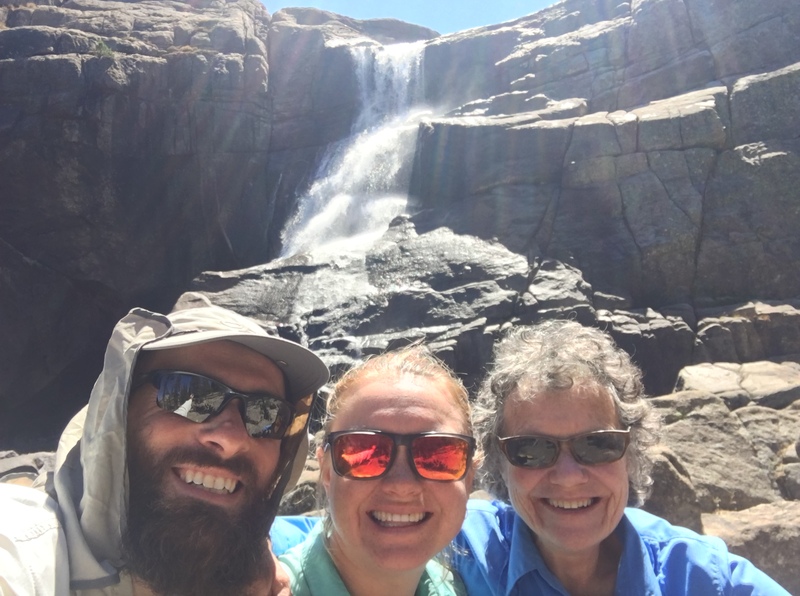 We crossed beautiful bridges and stopped for lunch at Tuolumne Falls. We hugged goodbye with Sue, grateful that we will see each other again in less than a month. 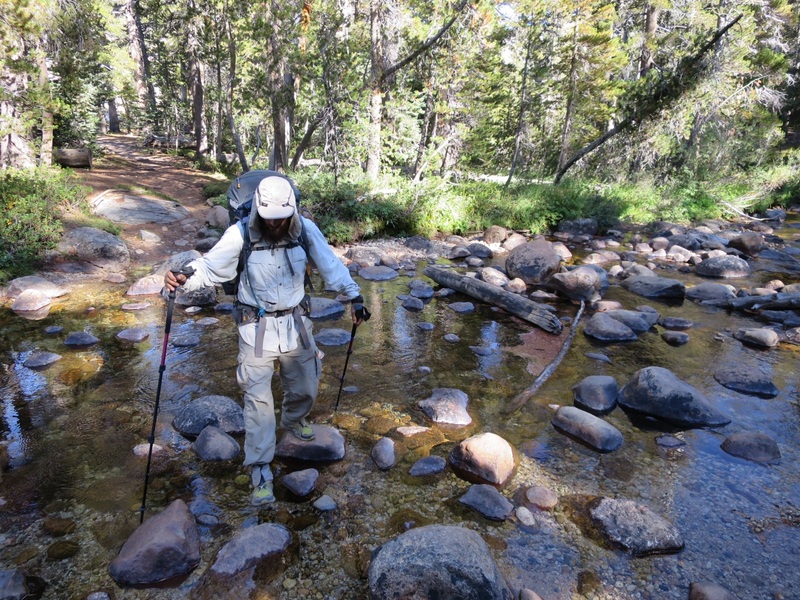 We continued on toward Glen Aulin camp and Sue returned to her van. The trail dropped down to a river which we crossed via a large steel bridge. The water below us cut through the slabs of granite and fell off into the valley below. The trail gradually gained in elevation as we walked through a quiet forest. Clouds of dust were generated by Laurie’s steps and Andy patiently walked through them all afternoon. We strolled through large meadows and met a number of hikers, including Cakes whom we first met outside of Chester, then again at Timberline Lodge and now going southbound to finish her hike. It is fun to see familiar faces and smiles. 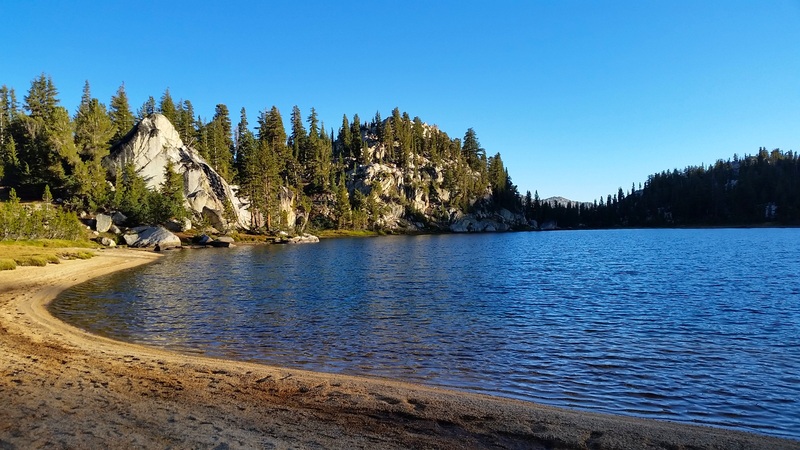 We ascended our final climb up to Miller Lake. Laurie was feeling sluggish most of the day but once plugged into an episode of a ‘Dear Sugar’ podcast she steadily climbed to our destination. We set up our tent on a little dome above the lake to avoid condensation and to enjoy every last bit of sunshine. We went to the lake with the intention of cleaning off but the sun dipped behind the horizon and it got cold immediately. Laurie sat on a log picking out dried cherries from our trail mix and talking with another hiker as Andy got water. We retreated back to our tent, which still had sunlight, and went about our nightly routine. It was cold by the time we got out of the tent to brush our teeth at 8:15pm. Laurie ambivalently requested we put on the fly. We both love seeing the stars, but the nights have been cold lately. We stay warm in our 20 degree bags with silk liners and hats but lately Laurie also sleeps in her fleece. We figured we should put up the fly and sleep warmer. Tonight we are grateful for the warmth of the sun and hard boiled eggs for breakfast. I love you too Donnie-thanks for taking the time to read and follow along.